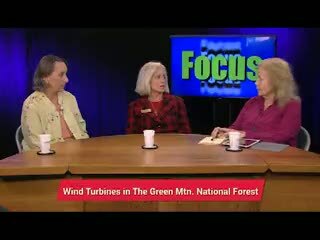 Annette Smith, Director of Vermonters for a Clean Environment and Representative Marianna Gamache, of the Vermont Legislature Natural Resources and Energy Committee, talk with host Margaret Harrington about the installation of the first industrial wind turbines in a national forest in the United States. Governor Shumlin officiated at a private ribbon cutting ceremony on private land in September to mark this 'first' which is approved by industrial turbine energy supporters like VPIRG, the Vermont Public Interest Research Group, but resisted by Vermont conservationists. Annette Smith brings up storm water permit issues and Rep. Gamache tells us what it was like to be turned away from entrance to Gov. Shumlin's ribbon cutting which was in conjunction with the cutting of beech trees in the now former bear habitat.